In the research of early Tarocchi the 20 trumps of Pierpont-Morgan-Bergamo-cards are mostly considered to be a proof of an early distribution of Tarocchi-cards (or Tarotcards or Trionfi cards) near to the style and order of the Tarot de Marseille, which became in later development the standard of modern Tarotcards. As the Pierpont-Morgan-Bergamo-Tarocchi is considered to be constructed in the reign of Francesco Sforza (1450 - 1466), the deck serves usually as argument, that Tarocchi decks or better Trionfi decks with the structure "4x14 pip+court-cards and 22 trumps" were common before that time. However, in none of these earlier documents seems to be any hint, that the number of trumps had been 22, so one must assume, that just this Pierpont-Morgan-Bergamo-Tarocchi and its strong similarity to the later Tarot is the single "proof" for this assertion. It is generally assumed by various experts of art, that the 20 trumps were painted by two different artists. 14 of them are believed to be painted by Bonifacio Bembo, 6 are painted by an unknown artist. This fact with some evidence is often interpreted as the result of an assumed scenario, in which 6 of the original 22 trumps were lost and later reconstructed. Two other cards, devil and tower, are considered to be lost in the same or a second action. However, there had been various suggestions by Tarocchi researchers in the past, that the mentioned six cards were not lost but added in later times, so that the original Bembo-deck actually would have then consisted only of 5x14 cards and the 14 trumps were originally considered as a 5th suit. Ronald Decker in the "Journal of the Playing Card Society - Vol. III. No.1 August 1974" made a suggestion in this direction, also I've heard, that John Berry presented once that idea, recently I became aware, that Ross Sinclair Caldwell followed a similar idea in the discussions of TarotL (2002). Without knowing anything about the arguments of Decker, Berry and Caldwell I developed independantly the same direction of research in 1989. Until now I couldn't detect anything in the documents of card research, which contradicts the hypothesis, that the 14 Bembo trumps were originally meant as part of a 5x14-deck, in the contrary I found other documents in playing card research, which hint into the same direction. 1. In the letter of Jacopo Antonio Marcello (1449) the author, who could be judged as a playing card expert of his time, doesn't show any hesitation to speak of the "strange" Marziano-Michelino-Visconti-deck with 16 gods (which wouldn't be in the modern understanding a pack of Tarocchi cards) as a new and fine kind of triumphs (novum quoddam et exquisitum triumphorum genus), by this way indicating, that neither the motives or the number of trumps in Trionfi-decks of his time had a canonical form. Ross Caldwell researched, that in a similar free way Polismagna, the translator of Decembrios "Life of Filippo Visconti", uses the term "Trionfi" for the same deck..
2. The fragmentarious Brera-Brambilla-deck, which is considered to be older than the 14 Bembo-cards, does only possess two trumps, so there couldn't be done any conclusions, how much trumps it really did possess in its original form. There is even an interpretation possible, that this deck only had 4 special motives at all. 3. The fragmentarious Cary-Yale-deck, which is also considered to be older than the 14 Bembo-cards, does only possess 11 trumps, so again there couldn't be done any final conclusions, how much trumps it had in its original state. The strange order of the court cards (six court figures instead of four) and the appearance of theological virtues demonstrate, that this deck should be seen apart from the standard, and it more testifies a general creativity in card production and not the dominance of any standard. There is an interpretation possible, that this deck was originally a 5x16-deck with some relationship to the chess-game. 4. The 9 Goldschmidt and 3 Guildhall-cards, which are also considered to be very early, also suggest creative freedom in early Trionfi decks instead of a any dominance by a standard. Other later decks and informations (Minchiate, Boiardo, Lazzarelli, Mantegna, Sola-Busca, the Rothschild-"Pope", the unknown "game of Governance of the World" and the unknow games noted inside the Rosselli-document), add to the argument of a great creative field instead of the imagination of the dominance of a standard-pattern. 5. 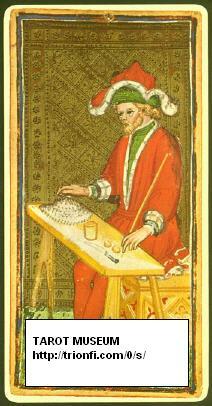 Decks with a 5th suit are already mentioned in the document of Johannes of Rheinfelden (1377 eventually changed 1429). The "Liechtenstein'sche Spiel" from around 1440, which is with 4 nearly Italian suits probably relatable to contemporary Italian decks and with its rudimentary form clearly no deck of the courts, has a 5th suit, which shows shields with heraldic devices. Other decks with 5 suits are known from Germany. "The cards had to be painted thick gold and all made with fine splendid colours: 'messe d'oro fitamente, et fate tute de colori fini et brunide, et depinte de roverso uno paro rosa, uno paro verde''. There were 'carte 70 per zogo' - not an easy number to explain. If we add the 14 cards per suit (the numerals from the ace to 10 plus the four faces, king, queen, knight and knave) to the 22 figured cards (the 21 trumps and the Fool) the figure does not tally. This question is still to be solved by playing cards specialists. See also Campori 1874, pp. 127 - 128." The article of Gherardo Ortalli gives great insights into the early card-production in Ferrara and contains many informations, which are not presented in the Tarot-Encyclopedias of Stuart Kaplan. Ludica 2 and other issues of the same magazine offer detailed informations of game research. 7. The Karnoeffel, famous as the oldest recorded card-game (1426), has a trump-suit and it "personifies" cards in the suit (only inside the game), as it is done in the Trionfi decks in clear form: One card is the "Emperor", another one the "Pope", another the "Devil" and a forth the "Karnoeffel". The rules of Karnoeffel show a way, how standard pip cards could be changed into "motives", by this forming the Tarot in natural "card playing". Forms of Karnoeffel are still played in Northern countries, see here. 8. The socalled Imperatori deck, mentioned for the first time in Ferrara in 1423, is regarded as being in "undefined" relation to Karnoeffel (at least by Ortalli and Pratesi), rather obvious especially by the fact, that an older farspread card play and Karnoeffel-variant in Suisse was called "Kaiserspiel" (Kaiser = Imperator). In the earliest reference the information is given, that there were 8 Imperatori cards (probably understandable as 8 additional cards, which were added to the normal substance of a deck - probably 4x4 court cards and 4x10 number-cards). Our new builded research group LTarot in the moment the hypothesis is discussed, that the Imperatori deck is a forerunner to the later 5x14-deck. 9. In the majority of modern rules of Tarock (as a play with cards) there is the total sum of 70 points inside the game (not in all variants, but in most). In my opinion this is a "rememberance" inside the history of this game, when it was played with 70 cards only. More to this problem you find in my article about suits and court cards and the number 70. 10. A further possible argument was discovered by Ross Gregory Caldwell (March 2003) in a note in the account books of Ferrara, in which the Trionfi painter Sagramoro got money at 1st of January 1441 for having painted "14 Figure" for the "amusement in the evening for Bianca Maria Visconti" (an analysis of the situation, which perhaps leads to further evidence about this entry, is in preparation: compare here).